Located near the city of Florence, OR at approximately the midpoint of the 400-mile Oregon Coast, the Sea Lion Caves are a connected region of sea caverns housing Steller sea lions, operated as a private wildlife refuge and bird sanctuary attraction. The first known human discovery of the Sea Lion Caves region of the Oregon Coast dates back to 1880, when local sea captain William Cox found the caves by accident through a grotto area along their western channel. Cox continued to explore the caves for several years and eventually purchased the surrounding land from the State of Oregon in 1887, which he owned until 1926. Following the acquisition of the land by R.E. Clanton in 1927, the Sea Lion Caves region became a proposed site for the construction of United States Route 101, bringing the prospect of increased tourism and travel to the area. In 1930, Clanton and his business partners J.G. Houghton and J.E. Jacobson began development of the caves as a public attraction, constructing a 1,500-foot trail in the nearby cliffs and a 135-step tower for access to the caves’ north entrance. Despite difficult construction conditions, the project was completed and the Sea Lion Caves were officially opened to the public in 1932. Throughout the mid-20th century, the attraction’s prominence grew throughout the region, and an Otis elevator was installed at the site in 1961 for easier visitor access. 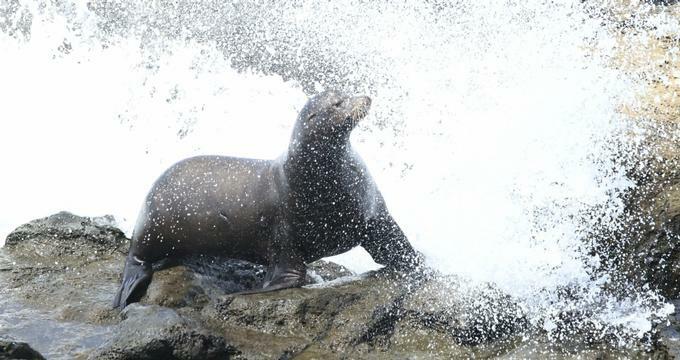 Today, the Sea Lion Caves are owned and operated by the families of J.E. Jacobson and business partner R.A. Saubert, who took over part ownership of the facility when Clanton withdrew his partnership in 1934. As a privately-owned wildlife preserve and bird sanctuary, the attraction is located near the city of Florence, Oregon at approximately the midway point of the 400-mile Oregon Coast, accessible via Highway 101. As one of the most prominent sea grotto areas in the world, the caves have drawn comparisons to the famous Blue Grotto region of the Mediterranean and are the largest sea cave region in the United States. The facility is a partner organization of the Oregon and Cape Perpetua Marine Reserve, which strives to protect the Oregon Coast’s marine life and ecosystems. The cave system, which was formed more than 25 million years ago, is made of basalt rock and spans more than two acres of floor area, with a dome reaching a height of 125 feet. Three entrance openings are located within the cave, including an entrance area with an elevated observation area for observing the entire cave system. Cavern walls are covered with a variety of lichen, algae, and mineral stains, with colorations giving rise to named regions of the caves, including Indian Maiden, Lincoln’s Head, and the Goddess of Liberty. The caves are best known as the only known mainland rookery and wintering home for Steller’s and California sea lions, which are visible throughout the year at the site. As the refuge area is not a zoo facility, sea lions are not present at all times, but frequently inhabit the caves in large population numbers during the winter months and spring breeding and birthing seasons. A number of bird species also inhabit the caves and their surrounding region, including Western, herring, and California gulls, Brandt’s cormorants, pigeon guillemots. Visitor access to the site is provided via an Otis elevator, which can accommodate 23 passengers at a time and descends 208 feet down the coast’s cliffs to the site of the caves. A whale-watching observation deck is also provided at an elevation of 300 feet above the coast, providing opportunities to observe gray whales and orcas. A small gift shop and museum facility at the entrance to the caves displays several exhibits, including an encased Steller sea lion skeleton on loan from Newport’s Hatfield Marine Science Center and a life-sized bronze sea lion family sculpture commissioned by artist Ken Scott for the 50th anniversary of the caves’ operation as an attraction. The caves are open year round, with the exception of Thanksgiving and Christmas Days, and ticket rates are available for adults, seniors, and children. In addition to standard visitor admission, guided tours of the caves are offered for small groups and organizations, including curriculum-incorporated field trip opportunities for elementary and secondary school students. Connecting lesson plans are available for elementary and middle school teachers, incorporating Oregon natural history, biological science, geology, and environmental science curriculum elements, either for use in the classroom or as part of guided field trip experiences. Curriculum documents may also be downloaded from the attraction’s website for homeschool students and extended learning opportunities connected to personal visits.